The National Weather Service In San Angelo Has Issued A * Severe Thunderstorm Warning For... Northeastern Coke County In West Central Texas... Southeastern Nolan County In West Central Texas... Southwestern Taylor County In West Central Texas... Northern Runnels County In West Central Texas... ...Read More. The National Weather Service In Midland Has Issued A * Severe Thunderstorm Warning For... Eastern Midland County In Western Texas... * Until 815 Pm Cdt. * At 712 Pm Cdt, A Severe Thunderstorm Was Located 17 Miles South Of Greenwood, Moving Northeast At 45 Mph. ...Read More. The National Weather Service In Midland Has Issued A * Severe Thunderstorm Warning For... Central Pecos County In Southwestern Texas... * Until 800 Pm Cdt. * At 709 Pm Cdt, A Severe Thunderstorm Was Located 7 Miles South Of Fort Stockton, Moving Northeast At 25 Mph. ...Read More. ...a Severe Thunderstorm Warning Remains In Effect Until 730 Pm Cdt For Northeastern Eastland County... At 708 Pm Cdt, A Severe Thunderstorm Was Located Near Ranger, Moving East At 35 Mph. This Storm Produced A 70 Mph Wind Gust At Eastland Airport Earlier. Hazard...60 Mph Wind Gusts. ...Read More. The National Weather Service In Midland Has Issued A * Severe Thunderstorm Warning For... Northwestern Midland County In Western Texas... Southwestern Martin County In Western Texas... * Until 800 Pm Cdt. * At 701 Pm Cdt, A Severe Thunderstorm Was Located Over Midland, ...Read More. The National Weather Service In Midland Has Issued A * Severe Thunderstorm Warning For... Southwestern Pecos County In Southwestern Texas... Northwestern Brewster County In Southwestern Texas... * Until 745 Pm Cdt. * At 656 Pm Cdt, A Severe Thunderstorm Was Located Near Marathon, Or ...Read More. ...the Flood Warning Continues For The Following Areas In Texas... Cowleech Fork Sabine River At Greenville Affecting Hunt County South Fork Sabine River Near Quinlan Affecting Hunt And Rockwall Counties South Sulphur River Near Cooper Affecting Delta And Hopkins Counties ...Read More. ELKHART – It didn’t take long for the sparks to fly during the Elkhart City Council meeting held on Monday, March 18. Next up was former Mayor Pro Tem Randy McCoy. He informed the council on the previous Friday, March 15, he was provided a document by a councilmember. “The document I was given was a legal document directly related to my personal finances and it was dated from 1999. After reviewing this legal document, I noticed my full social security number was fully visible along with account numbers,” McCoy said. He added Sheridan was not at the office when the document was delivered and that another employee had placed the documents in the council boxes. As he continued, McCoy explained he had distributed copies of the original document from 1999 to the council members as well as the copy which had been recently given out. 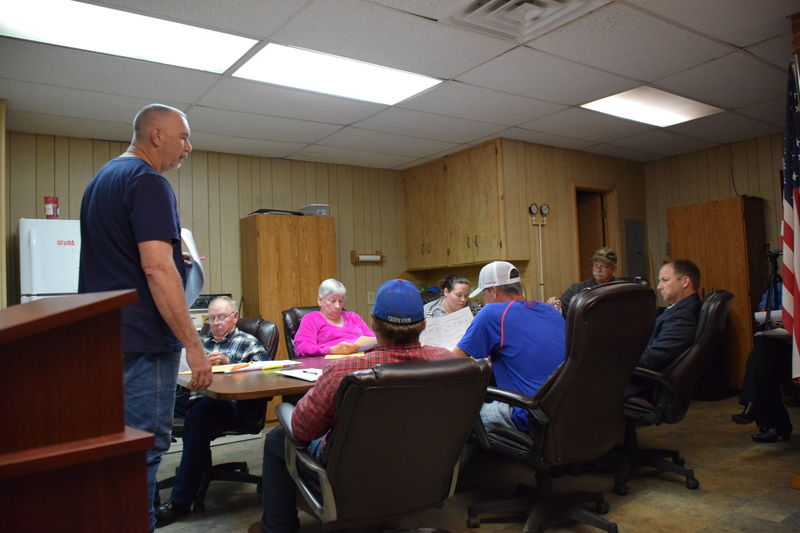 Following the public forum, the first order of business addressed concerned the opening of sealed bids for new vehicles purchases for the Public Works Department. It turned out only one bid was received and after a lengthy discussion, the bid from All-Star Ford was approved. Once the vehicle discussion concluded, Financial Adviser Joey Dierker – from Hilltop Securities – spoke to the council about funding options for the city on Texas Commission on Environmental Quality mandated system repairs. Dierker presented three possible plans. The first involved funding a $2.5 million initiative, the second was for $3.5 million and the third was for $5 million. According to Dierker, the financial tool used in funding the $2.5 million initiative would not result in a utility rate increase. At the $3.5 million level, it would result in a rate increase of $8.75 per water connection. At the $5 million level, the cost increase would be $17.25 per connection. The matter was tabled for further consideration. Immediately after Dierker’s presentation, the council adjourned into executive session to discuss personnel matters. Just over an hour later, the council reconvened in open session and voted to invite applicants to interview for field positions. The council also tabled an agenda item concerning the hiring of a city administrator. As the meeting continued, an ordinance establishing guidelines for manufactured homes was approved by the council. The ordinance would prohibit any type of mobile home fashioned prior to 1976 from being brought into the city limits. The ordinance will also require HUD code standards, skirting and inspections on utilities must be conducted. An ordinance establishing guidelines for subdivisions in the city of Elkhart was tabled for further consideration. A discussion about prices from KSA Engineers for extending sewer lines in the city of Elkhart was tabled for further consideration. A date for audit findings was established by the council. Financial reports for February 2019 were approved. April 13 was designated as a clean-up day for the city of Elkhart. Sheridan Street on the north side of the school was renamed as NW Sheridan Street “… so that the city can accurately address each school house for 911 services and better record.